Visit our barn - Welcome to Jolly Egg Farm! We want you to come see a real Egg Farm! Our barn accommodates groups of 30 to tour our barn and see how everything at our barn works. The design of our barn allows our visitors to walk through corridors that are separate from the operation - allowing for full viewing with no disturbance to our hens. 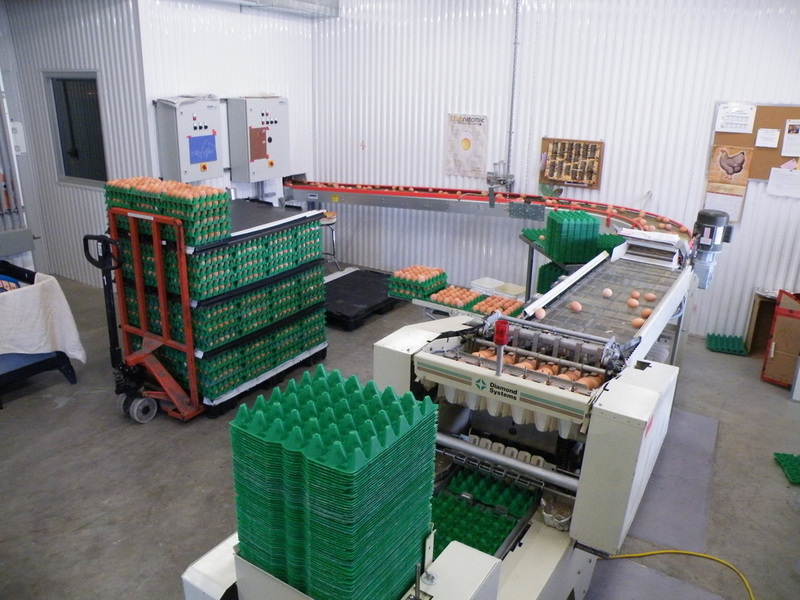 You can see how our eggs get packed, refrigerated, and more importantly - you can see our 9,000 chickens! Please click here for further information. Read on for a brief description of how our barn works. It's like a egg amusement park. The Jolly Egg barn is set in a secluded field surrounded by forest. The hens are securely housed in cages that run the length of the main barn. The lights are slowly brightened by computer to wake the hens up each day at about 6 am, and begin to fade again by 8 pm to let them sleep. Feed troughs bring fresh grain to the chickens five times a day and water is available from dripper feeders in the centre of each cage. Manure drops through the cage floor and is carried out to a separate storage shed by a series of conveyor belts every day. The newly laid eggs roll down the gently inclined floor of the cage and onto a small conveyor belt which keep them out of the way of the hens. Twice a day, the conveyor belt bring the eggs slowly into the packing room, where they are placed into plastic trays of thirty by a machine. The eggs are carefully checked and graded with cracked or misshapen eggs removed from the days pick. 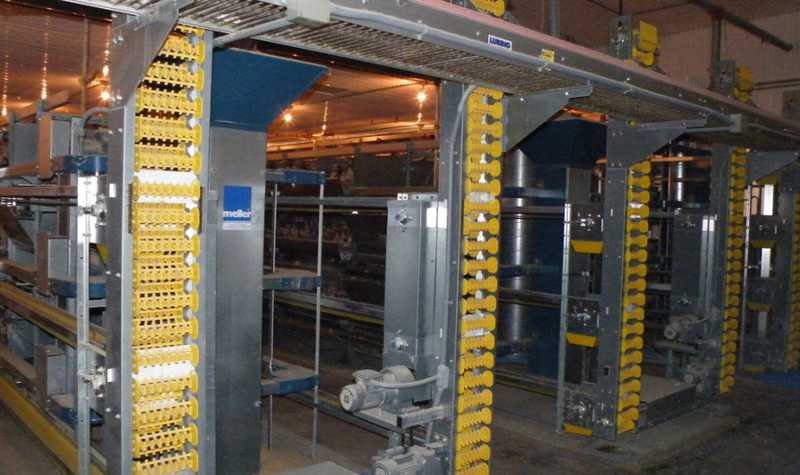 The days eggs are promptly chilled in a large walk -in cooler room, awaiting weekly pick up by Burnbrae - all of our eggs are produced for this well known Ontario company.